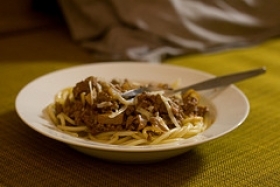 Have you made Baccala Alla Bolognese? 1. Put the cod in a deep dish, add cold water to cover, and let it soak for 2 days in the refrigerator in order for it to "plump" up and change the water several times. 2. Rinse and dry the fish and cut it into 2-inch chunks. 3. Dredge the fish in the flour, shaking off the excess. 4. In a large skillet, heat 2 tablespoon of the butter and the olive oil. 5. Add the fish pieces and brown them well on all sides over medium-high heat. 6. Sprinkle the fish with the minced garlic and parsley and stir the mixture gently. 7. Cut the remaining 2 tablespoon butter into bits and add it to the pan. 8. Sprinkle the fish with salt and pepper and pour over the lemon juice. This recipe contains potential food allergens and will effect people with Wheat, Lemon, Fish, Butter, Gluten, Garlic, Iodine, Codfish, Olive Oil, Citric Acid allergies.